The circumstances around this event bear careful examination. For they reveal not only a betrayal of the university’s fundamental purpose, but also the loss of something far more wide-reaching, something without which no higher civilization can survive: a shared understanding of ourselves. Jordan Peterson is an academic and clinical psychologist who has taught at two of North America’s most prestigious research universities (Harvard University and the University of Toronto), and whose academic work is prominent, widely-cited, and non-controversial in his field (see a list of his research publications here). His courageous and articulate defense of free speech, of our political, cultural and religious inheritance, of unpopular but incontestable truths of science—especially biology—and his radical opposition to identity politics of any kind, including that of both Right and Left, have made him an iconic figure. But what is by far the most significant thing about Peterson is that he reaches vast numbers of young people, often through Biblical stories and ancient myths, with perennial truths—of freedom, responsibility, the dignity of the individual, the transcendence of beauty and suffering and, above all, the liberating nature of Truth itself. On November 2, 2018, I spent the day with Peterson in Cambridge, England. 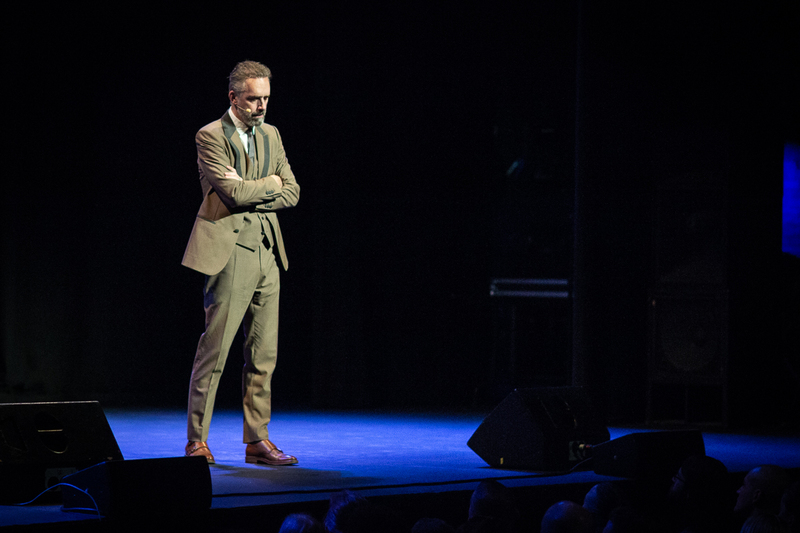 He had given a sold-out lecture at the fabled Corn Exchange the day before, and there was a full day planned for him at the University ahead of the next city stop on his lecture tour. I met Jordan and his wife, Tammy, at their hotel at 9:45 a.m. We walked from there to King’s College (one of the 31 colleges of the University of Cambridge, est. 1209) so that they could see the Chapel, one of the great buildings of Europe. Then we went to another college for a discussion about higher education, then to still another college for lunch with a group of theologians and philosophers, then back to the first college for a conversation with Sir Roger Scruton, then to a local restaurant, then to St John’s College Chapel to hear its Choir sing Duruflé’s Requiem; then I dropped him at the Cambridge Union, where he was interviewed by a student before a large student audience; we met again later in the evening for a lively dinner with an eclectic group; and finally said goodbye around 11 p.m. when the Petersons walked back to their hotel. It had been an intellectually exhilarating and aesthetically inspiring day, the kind of day that I have come to expect in Cambridge, where architecture, Evensong, and intellectual vivacity seem to speak, even to the visitor, of 800 years of learning, of achievement, and of aspiration for deep and worthy things. Media reports of Cambridge’s decision to rescind Peterson’s Visiting Fellowship made it seem as if he was widely disliked at the University—a controversial, divisive figure. That wasn’t my experience. During the day we spent together, walking around the busiest parts of campus, four colleges, two chapels, a restaurant, and through the city’s busiest pedestrian thoroughfares in broad daylight, there was not a single hint of negativity: no heckling, no awkward encounters, not a peep. To the contrary, we could generally not make it between any two places without someone—the man working the hot dog truck next to the Cambridge Union, a soft-spoken female student, a young woman in a restaurant—reaching out to him politely, often with shyness, to express gratitude, to shake his hand, to ask him to sign their books. Every interaction, without exception, was friendly and warm. Over dinner that night, Douglas Hedley, Professor of the Philosophy of Religion and a member of the Faculty of Divinity, asked Peterson if he would consider making a longer visit to Cambridge sometime. Peterson said that he would indeed welcome the chance, especially to engage with Biblical scholars to help him prepare a series of lectures on the book of Exodus (Peterson’s lectures on Genesis have been watched by millions). In addition to this arrangement, the Faculty of Divinity invited Peterson to apply for a Visiting Fellowship (a more official, but also unpaid, association). At their request, Peterson submitted the application (which required a plan of research and two letters of recommendation). His application was considered by the research committee of the Faculty of Divinity, which decided in due course to offer him a Visiting Fellowship. Notification of the decision, along with a written invitation and agreement, was sent to him. Then, only a few weeks later, came the misleading announcement via Twitter—misleading because the fellowship was not ‘requested’ by Peterson; he was invited to apply. And the review was not merely an ‘initial review’ but rather the standard process by which such fellowships are awarded. It’s not usually a two-part process. This tweet was sent at 12:55 p.m. But—and this is a disturbing but critical detail—the University had not, in fact, released a statement. There was only the deliberately misleading announcement, quoted in the CUSU’s tweet, from the Faculty of Divinity, which was sent three minutes later, at 12:58 p.m. The care with which this information was internally curated for public release did not, however, extend to communication with Peterson. He was notified of the decision only after it had been publicly announced. Nor was he given any indication of the research committee’s rationale, nor any chance to address its concerns. Hours later, an unnamed “university spokesperson” was quoted in the Guardian saying that Peterson’s fellowship had been revoked because “[Cambridge] is an inclusive environment and we expect all our staff and visitors to uphold our principles. There is no place here for anyone who cannot.” What those principles are or what Peterson had done to violate them was not specified. Only five days later did the purported rationale for the rescinding of the Fellowship finally emerge, from Vice-Chancellor Stephen J. Toope: that Peterson had “endorsed by association” the message on a T-shirt—“I’m a proud Islamaphobe [sic]”—worn by a fan with whom he had taken a photo. Had the representatives of the Faculty of Divinity conducted some cursory research into Jordan Peterson they would have discovered that he is an opponent of all forms of sectarian hate and violence, and that his entire project is devoted to countering the nihilism that underlies identity-driven conflict and the alienation it gives rise to. Peterson’s interest in Biblical stories and other myths is inspired precisely by his effort to address that alienation—he believes that these stories convey the metaphysical underpinnings on which individual psychological health and social harmony depend. To insinuate that Jordan Peterson is a contributor to sectarianism and division is the opposite of the truth. If there were anyone you’d want an alienated, disaffected, potentially violent young man on the edge of doing something terrible to listen to, it would be Jordan Peterson. If you doubt this, spend a few hours reading through comments on his YouTube videos: his work is having a transformative effect on the lives of many by helping them turn from resentment and hopelessness to meaning and responsibility. To suggest, then, that Peterson would incite violence of any kind, let alone connect him with the massacre of innocent Muslims by a killer motivated by identity-driven hate, is slanderous. To remove his books from sale in the hope of reducing such violence, as a bookseller in New Zealand recently did, is also dangerous—equivalent to denying sick people access to the very antibodies that can heal their disease. That the committee did not offer Peterson an opportunity to address their concerns is what really shows their hand. For if they had been genuinely concerned that he was endorsing anti-Muslim sentiment—which reasonable people who did not know Peterson might have been—they could simply have asked him. But no: Peterson’s providing a reasonable explanation for the photo’s existence (as he readily did for the Times) is precisely what they wanted to avoid, for that would have made it impossible to use the photo as an excuse to withdraw his fellowship. Perhaps it will emerge what particular forces were at work in this sorry affair—whether misguided good intention, cowardice, ressentiment, Machiavellian internal politics, or hatred for truth itself. But whatever the particular motivations that led to this scandalous episode, this is about more than the actions of a few academics, or Peterson’s fellowship, or even the University of Cambridge. What is at stake are the conditions of human flourishing itself. For there can be no peace, no freedom, no protection of the weak and vulnerable, no pursuit of happiness, no discovery, no science or art; in short, there can be no higher human culture at all, without access to the realm of higher things—of truth, beauty, and goodness—in which we all, by nature, can come to dwell. What, indeed, would be more restorative for our culture in this volatile historical moment than finding ways to re-imagine ourselves, together, on a journey in the wilderness, but seeking the promised land? Perhaps the Faculty of Divinity will yet reverse course. I dearly hope they will, for their own sake. But this situation is not exceptional: if it were, Peterson would be overwhelmed with invitations from universities around the world. That he is not is proof of how completely at odds institutions of higher education have become with their essential purpose, and from the young people who seek the education they are meant to provide. However, if Cambridge’s withdrawal of Peterson’s invitation is an accurate reflection of a widespread betrayal of purpose and systemic failure, Peterson’s worldwide popularity shows how ripe that system is to be challenged. Handwringing and despair, while tempting, only serve to affirm the status quo when in fact the broader situation reveals not intractability but rather how quickly true alternatives could now take hold. Peterson has shown there is now very strong global demand, especially among the young, for serious engagement on substantial questions—and if Cambridge and other universities won’t meet that demand, it’s up to us to set up alternative institutions. I am engaged in the founding of one such institution (which includes Jordan Peterson among its Board of Visitors, as well as many other distinguished figures) that will be, in the words of Emma Lazarus’ beckoning sonnet, a Mother of Exiles: a place for intellectual refugees whose honesty, seriousness, and brilliance have made them unwelcome elsewhere. But whatever the fate of that particular venture, or of other new shoots now appearing, I predict future historians will look back on this moment, in which the University that many regard as the finest in the world turned down the chance to host the scholar most globally in demand, as the inflection point around which major shifts in the landscape of higher education occurred. All who seek a more coherent, more intellectually adequate and more fully human culture, must hope it will be so. Stephen Blackwood is a theologian and the founding president of Ralston College. He may be reached at sblackwood@ralston.ac or on Twitter @stephenblackwd. Oops! Sorry Rico…. Thought you were commenting on 1 of my blogs, instead of in here. Nice piece. It contains very interesting, and I feel very accurate, commentary. JP seems to reach people who haven’t been directly spoken to for years, if not decades. His message of taking personal responsibility is a very timely and necessary one. One of my enduring pet peeves is that people are quick to assert their “rights”, but rather feeble in fulfilling their responsibilities. And Peterson challenges them on such failures, and strengthens them in the process. It hardly needs to be said that Peterson’s reach now far exceeds anything that anything university has (even one as esteemed as Cambridge), or anything such institutions can reasonably hope to attain. THe only unanswered aspect is the longevity of that message, and whether it will “age” well. But if it spawns its own institution, as the author suggests, that should go some ways to ensuring that the message has legs. JP has since savaged Cambridge on SoMe, rightly and deservedly so. “Ham-fisted” does not begin to describe the clusterF they created for themselves in an effort to placate the SJW’s. It’s not as if “religious studies” is a hot topic these days, and it’s plausible that an association with Peterson would’ve increased the appeal of the subject matter in general, and of the Faculty of Divinity at Cambridge in particular. While it may have been an attempt to deplatform JP, I think this will turn out to be Cambridge deplatforming themselves. Great comment SC – couldn’t have said it better myself. Does anyone know why the Cambridge Divinity School feels it necessary to kowtow to the SJW left? Is it in financial trouble? Are its chief influencers from the left (That seems strange for a divinity school)? Does it simply not have the fortitude to withstand unwelcome publicity for a short time? Have new faculty hires been predominantly from the left? I hope the answer is not, “All of the Above.” Thanks. For the same reasons everyone else (including corporate America) kowtows. In addition, theologians and religious scholars see infer faith dialogue and social justice as a way of staying relevant in a society that no longer has much use for the official state religion. Hate preachers from Pakistan who actively promote persecution of Christians go on tours of the UK where Church of England officials welcome them with open arms and red carpet treatment. The hallmarks of modern academia are cowardice and conformity. Having experienced only the academic world they are a smug elite specializing in bullying undergraduates and suppressing any view that does not conform to their stagnant leftist ideology. Should the Marxist state they worship ever emerge they would be the first shot by the Felix Dzerzhinskys who would police it. You are dead on about religious studies. Many seminaries have added under grad colleges just to stay alive. They had become too narrow and agenda driven. Indoctrination centers. Peterson brings a philosophical approach to the topic which is much needed. I once heard Peterson say in an interview that if his lectures had not been public, he probably would not have survived the C-16 hearings. That says it all. That’s how I discovered him. From his appearance before that group, I researched him. @shapiro definitely sees himself as epic. Cambridge has fallen. What stands? Julius Peterson? Aptly quoted, RA. Nicely said for a poorly educated person, in fact nicely said for anyone. You are mistaken in your definition of education, it is the people of Cambridge who are poorly educated. You are not uneducated , Cambridge University is. I’m serious. The funny thing is, all of this is happening under Tory government. Brexit is meaningless as UK is, in itself, more inclined to punish thoughtcrime then any EU countries, except Scandinavian ones, perhaps. Freedom has been lost from within. It is over for the free speech in Britain, that ship has sailed. Recently, I worked with two consultants from London, both British. There was also a lady from Madrid and a Milanese. Spanish lady, Italian and I discussed the influx of muslim immigrants, how to integrate them and how to stop further influx. British guys dared not say a word. They thought the very topic was not to be discussed. I recently read an article about trans-rights in the UK. Well, really, it was about legal suits being brought against people for “dead-naming,” “mis-gendering,” and otherwise expressing “hate” against trans-people—“hate” as defined in some UK Communications Act. To witness such goings-on in the homeland of John Stuart Mill is extraordinary, and extraordinarily depressing. Reason will prevail in the end. The enemies of civilization have been working very hard now for many decades to destroy our society from within. That they are wholly evil does not mean that they will lose. That normals aspire to be good does not mean that we will win. What all beings actually require are Divine Compassion, Love, and Blessing – the Thread of Divine Communion with the Living Divine Reality made Certain and True, and directly experienced. Without such Divine Communion all of the usual (at best) hopeful words are just ashes. They do not need self consoling long-winded ideas about Genesis. Nor with essentially impenetrable archaic now obsolete Biblical based symbols. You will not find even a hint of the possibility of Divine Communion at any of the so called divinity schools, or the means for doing so. So too with the people that Stephen Blackwood associates with – specifically the new Ralston College. Nor will you find such a possibility in anything that Jordan Peterson has to say. He does, perhaps, hint or point to such a possibility. But in the meantime all that he offers are a lot of self-consoling ideas, none of which can make any real difference to anyone. Keeping in mind that Jesus was scathingly critical of the ecclesiastical and political establishment of his time and place – they even conspired to have him executed. And of course the “resurrection” never happened – could not have happened. Would Jesus be recognized or even welcome at any of the many so called divinity schools and seminaries. And Ralston College which is very much associated with the now-time political and ecclesiastical establishment. Every sensible Western atheist supports the flourishing of Christianity. I’ve never been accused of being sensible, so may I ask why? Some might answer that it is a barrier against radical Islam or against postmodernism but it doesn’t seem to work that way in practice. SJW nonsense has infected our churches to nearly the same degree as our universities. Catholic universities are no less woke than secular ones. Churches are just as much a business as anything else. They seek to appeal to potential members. That means appealing to the 16-30 year olds to stay alive. They have become downstream from culture. Well said, Fickle Pickle. Are you waiting for the new Son of Man? It reminds me of one of my favorite Rick & Morty episodes. There is no authentic existence without Divine Communion. All actions and states of knowledge and experience are painful and problematic until the sinful presumption of separation from the Living Divine Reality is transcended. without such Divine Communion there is no True humanity, no Real responsibility, and no True freedom. Without such Divine Communion the individual is simply a superficial functional entity living out his or her pre-patterned karmic adventure in functional relations. There is no Sacred or Divine Plane to his or her awareness. Or we manifest the Divine perfectly regardless of any perceived separation from it. We are fully authentic in spite of ourselves. Such judgement remains beyond our paygrade. The stories are how you teach the lessons. Vague platitudes are ineffective, especially in the modern world where the faith has been broken. The archaic stories carry the meaning. You’re taking for granted the foundation on which your faith is built. I don’t know if it actually is FP’s faith, so to speak — they apparently don’t believe in the Resurrection. Stephanie, thank you for saying that. It’s been a long time, generations, where these old stories and ideas, stoic and biblical, have been thought to have any real relevance or could provide any real guidance. Peterson himself admits he’s no great originator of ideas, all he is saying is there is something real in them that may fill the real hole that exists in many. Give me a boy of seven and I give you the man, or something similar in different words. Well, some vague postcard words about Divinity are far too little, far too late, and more importantly of too few answers. But discussing the Stoics and ‘the Books’ and trying to digest them is not. Dr Blackwood, God speed to you and the development of Ralston College! I also hope JP is successful developing Humanities U based on The Great Books. It is critical to stop bellyaching because universities are obviously now indoctrination centers. That ship has sailed. Nothing will change them until applications dry up. And only the success of schools such as Ralston and excellent technical training centers will attract the applicants. This sea change has begun. Eventually it will turn into a tsunami. This is my view. It’s time to move on with new opportunities. This is anecdotal but sums up what is really happening: A friend of mine is Dean of a large Technical college. He is blown away at how many applicants are college grads with degrees in criminal justice or sociology/psychology. They are seeking careers to pay off their student loans. This is a tricky topic because “credentials” are necessary for specific tracks but it seems we have overplayed that hand in every area and they have become meaningless in too many ways. Amusingly I got an Oxford advertisement in the middle of the article. So did I! £4,600 for a summer course. If there is an argument for tenure this sort of case provides it. If not for tenure, I would bet serious money that J. Peterson would have been fired several years ago and be out of academia due to his “controversial” political viewpoints and associated jealousy and resentment among his firing colleagues that his “controversial” viewpoints are so highly popular with deplorable types around the world. His stellar publication record and excellent teaching evaluations would not be enough to save him from Leftist desire to deplatform such a “dangerous” person from his high status U. of Toronto position. In contrast, faculty unions and administration invariably go to the wall to protect the “free speech” and “academic freedom” rights of university faculty who make the news with public statements and classroom lectures advocating hatred, discrimination, and violence against whites, males, police, Christians, Jews, and the wealthy/successful, even though these people are invariably hacks who have rarely if ever published anything of substance and are unpopular in the classroom. Go figure. Yes. Only tenure has protected JBP from dismissal. Tenure is on the face of it a silly idea — job for life? No standards? That’s for judges and other deities. But we see here how valuable it can be. I disagree. It is tenure itself that has brought us to this moment. It is tenure that has led to an unaccountable, politically radicalized academe in the first place. Good point but the administration is a bigger problem than the academics and they don’t have tenure. The rationale given by Professor Toope is deeply disturbing and antithetical to his own statement of the universities values. Professor Toope states that “casual endorsement by association” of the message “I’m a proud Islamophobe” is the reason. The idea that endorsement by association is possible, let alone that such association is so significant as to warrant excluding a scholar is deeply concerning. It strikes at the foundation of rationale debate. FOcusing not on argumenst made but those casually associated with those making specific argument. Everyone is vulnerable to this for who does not have a relative, friend or associate with disreputable views or worse? It is oppressive and totalitarian in concept and effect. The exclusion of someone because of who the associate with is directly antithetical to these values. It prevents any discussion across boundaries as even the most moderate representative of paticular set of views will surely associate with those who hold more extreme versions of those beliefs. It is also impossibls to reconcile “respect for all others, even those with whom we disagree fundamentally.” with the exclusion of someone who merely casually asssociates with someone with whom they disagree. I am a graduate of Cambridge University and I found the statement by Professor Troope of even more concern than the original statement about Professor Peterson. This is an official statement by teh faculty of Divinity yet shows a deep hypocrisy and obvious failure to uphold their own values and a apparent failure to recognise that this is the case. Christ broke bread with publicans and sinners. It’s good to know where the faculty of Cambridge Divinity stands. MYB –> I was going to make a comment further down but yours caught my eye. I was thinking the same thing. Jesus preached love for everyone regardless of their sins. He was also not enamored of the Pharisee’s or the Sadducees (of which many SJW’s appear to be) and other leaders of the Jewish religion. It would be fun to witness a debate session between Jesus and some of these SJW academics. However, they would probably not understand what they were being told. I’m an old man, but it seems more and more like the Social Justice Warriors are becoming the judges of what is right and wrong and the executioners of the judgements against people. In essence SJW’s have put human law about God’s law. Talk about history repeating itself. The SJW’s have self-appointed themselves as the people who are qualified to cast the first stone. Just like the revolutionaries in France and Russia this will not work out well for them! Excellent comment! How I wish more people will pay attention to it. For those with attention deficit, allow me to quote the key: “It prevents any discussion across boundaries as even the most moderate representative of particular set of views will surely associate with those who hold more extreme versions of those beliefs. ” That’s exactly it! When you write off people (the initial stage before concentration camps and crematoriums), you dismiss the notion that they should enjoy the company of what you consider actual human beings, and you assume that that their positions are beyond redemption – which makes communication unnecessary in the best case scenario. How pathetic! How sad! Indeed, how grotesque to see the representative of a “Faculty of Divinity” lay out the red carpet for intolerance and the depersonalization of actual human beings! If you happen to be a student in that monster den – run away! There is not a trace of Christ’s teachings left in there. I caused this, it was i in the photo with him in Auckland. Initially i felt so guilty, but then realized my intent, as in the words on my tshirt, were to provoke dialog, not to hurt the great JP. He will survive this, i however have lost my job. My own fault, this was prior to Chrustchurch. Had i known, of course I’d not have worn it. Seriously, can we not call out the insidious word, Islamaphobia for what it it s, FAKE. A word designed to in gender the same emotions as homophobia. Yet they could not be more poles apart. Islam truly is homophobic, and much more. So much silence, and I’m sorry to say, from my hero JP. Did JP notice your t-shirt before posing for the photo? I’m sorry you lost your job, it’s unfair. The nail that sticks up gets hammered down. JP has quite intentionally tired to be apolitical although sometimes his hand is forced, such as his refusal to obey Canada’s pronoun laws. From what I can tell, he’s merely interested in kickstarting people’s lives into a more meaningful state using very basic, but well thought out ideas. I hope he can stay this way, but there’s a lot of people who would like him to join them on their stupid merry-go-round of modern culture. I am in complete agreement with your assessment of the word Islamophobia – that is a fake. A word, created by fascists and used by cowards, to manipulate morons. And in this particular case, your shirt, and the reaction to it, seems to have proven your point precisely. I feel very confident in saying that even if you hadn’t worn the shirt, I can guarantee you the CUSU would have found some other pathetic excuse to use to advocate for banning Peterson from the campus. “You find me the man, I’ll show you the crime”. Your t-shirt is nothing more that an post-hoc explanation of a pre-ordained decision. Kia kaha Andy. Keep fighting the dark forces of left wing intolerance. Islamophobia is not a very good term to be using, but I think there are good people on both sides here who are talking at cross-purposes. Many people who use the term Islamophobia are critical of Islam, but are using it to describe anti-Muslim bigotry. When they see someone with a T-shirt saying ‘proud to be an Islamophobe’, or whatever, it’s bound to lead them to think that the person in question is endorsing anti-Muslim bigotry. I do wish that many of the well-meaning people who use the term Islamophobia would instead shift to using the terms anti-Muslim bigotry or Muslimophobia. That we are still having semantic debates is surely an indictment of both parties. One insists on using ‘Islamophobia’, and the other on occasion is more interested in ‘triggering the libs’ than actually explaining, respectfully, that they understand the concerns of those who use ‘Islamophobia’, but that it’s the wrong term to be using. Do you ever hear the word Christophobe? I have started using this when accused of being another “ophobe”. The word encompasses those who don’t follow the Golden Rule: Do unto others (even sinners) as you would have them do unto you. SJW’s can’t stand to be called this. It makes them consider their own actions. @jim Gorman, I am appropriating that term! Love it. It’s the only way to go since rational discourse is now verboten. I am a fan of Jordan Peterson’s and I would not hesitate to grant that there are problems with Islam, but I cannot imagine how a shirt like that could be provocative in a constructive way, or what the hell Jordan Peterson was thinking taking a picture with you while you were wearing it, given the current climate. And, frankly, I think you both deserve some criticism for it. If anybody could explain to me why neither of you do, I would love to hear it. “..,what the hell Jordan Peterson was thinking taking a picture with you while you were wearing it, given the current climate”. My guess is he would pose with a Che shirt wearer, too, who came to hear him. I am more concerned with the outrage mob looking for any hint they can exploit on SM to ruin someone. Do these people forget that Jordan Peterson is also human? Imagine being invited to apply for a job you’re very excited about, the interview and application go well. You’re told you got accepted, so you think everything is all set and…BAM! The company sends a message to all of your family and friends to tell them that you got rejected. You find out from them. Who is the unnamed “university spokesperson” and who sent the CUSU tweet? Let’s have it then. I would like a follow-up article, soon, I hope, and if not from this author, then from somebody, naming names, displaying photographs and showing the relationships of their past associations. Such people cannot be allowed to dwell in the shadows. The Wiki on Stephen Toope is interesting. He’s Canadian, from Novi, it appears. His prior positions were at U. Toronto (2015-17) and U. British Columbia (2006-14) and he was appointed vice-chancellor at Cambridge by majority (I assume) vote of the academic staff admitted to Regent House. His major professional interest seems to human rights. I assume his pro-vice-chancellor for institutional relations, Eiilís Ferran, would be involved in this. The CUSU tweet was sent first, is this a case of the tail wagging the proverbial dog? If they were ‘real’ Christians they would forgive him. Modern progressive Christianity has embraced envy and has rejected forgiveness. Except that he is not asking for, or in need of, their forgiveness. That said, it is clear the thin veneer of Christianity they present is merely a facade behind which they pursue other antithetical ends. I fully realise that I am flying close to the boundaries of conspiracy here, but could the whole thing have been a set-up from the start? An attempt to sully JP’s name and reputation. I confess to having had similar thoughts, Stephenitisok. Unfortunately for Dr. Peterson, the Christchurch massacre happened not long after he was in Australia on his lecture tour (when the incriminating photo was taken). It’s beyond reason to think he is implicated in that tragedy, but he makes a convenient scapegoat for people to hang their pain and outrage on. JP has had his picture taken with thousands of people in the last few years. He probably didn’t even notice the shirt. Or set to further JB’s status as a martyr for free speech? Equally implausible I’d say. Is conspiracy is more attractive than the banal? I suspect that this is a very small blip in JP’s career. After all, there are no impediments against collaboration with people who agree to work with him, including those at Cambridge. JP has ‘gone viral’ in, even to him, a most unexpected way. Whatever chord he has struck will continue to resonate with people who find his ideas, and encouragements useful, despite the narrow thinking of such people. Grant, I agree. Prior to this disgraceful event, I had never heard of Peterson. I can assure you I am now extremely familiar with, and approving of, his mission as is my college student son, to whom I introduced him. Time will tell, but we may find this entire unsavory business ultimately advances his work. It has certainly brought him a broader audience than he had before. This is the kind of hyperbole that the internet was made for. The hyperbole is warranted though, because what this story reveals is the complete erosion of goodwill that has taken place in academia. The pattern is identical to that in the Tim Hunt affair when one line of a joke quoted out of context was accorded more weight than a whole lifetime of honorable work. The burning question in both cases is why neither Tim Hunt nor Jordan Peterson was given a hearing. Why was there no presumption not just of innocence but of decency? Without such a presumption, also known as goodwill, there can be no meaningful discourse. The stakes really are that high. Does anybody today really concern themselves with future historians? Considering what current historians are doing to beat down past historical figures, perhaps their blessing would be a curse. How many people struggle today with the millions of inflection points from the past, inflection points that are never well documented or easy to understand once you are out of context? You can like JP, but the odds he becomes a historic person are small. The last global financial bubble at an economic high was in real estate. The current cycle seems to be peaking with a bubble in academic tuition. When I consider the culture of toxic arrogance that has gone along with the tuition bubble, I dearly hope that the crash that is about to follow will be as deep and humiliating to the perpetrators as the crash in real estate was. Out of the wreckage, we will salvage new ways of giving our young people a real education. Do you believe the photograph mentioned above was the reason the invitation was rescinded? Or was it merely an excuse? This episode reminds me of the Marian Anderson / Daughters of the American Revolution affair of 1939. In both, a significant public figure was treated shoddily because of something entirely extrinsic to the matter at hand. If intolerance of dissidence any better than intolerance of race? Why oh why was Dr. Peterson not given a heads up about the wokeness of the Cambridge Divinity School? Isn’t the default and precautionary principle now that ALL universities are engines of grievance? He could have accepted a written invitation to apply and lobbied through established contacts to make sure it would be an above board process. Instead he was allowed to be a supplicant and pawn. Be warned and be better prepared! I agree with Sir Roger Scruton; the only way to put a stop to this is to withdraw huge amounts of government funding. In the place where I live the liberal types fall all over themselves year after year to funnel more money into the university system, and raise tuition on top of that. I just don’t see this trend reversing even a little. You and Sir Roger are right, of course. Until 1919, the UK universities were private. By 1914, most universities were broke and under the Haldane Committee became nationalised to receive government money. Consequently, since 1945 universities have been controlled by the left wing Dept of Education. Sir Roger Scruton is correct. I suggest universities borrow the money and lend it to students who have to pay back the loan. Universities therefore have an incentive to produce students who can pay back the loans. Funding should be terminated for these repressive so-called universities and their slavish eco-chamber propaganda. These universities are consigning themselves to irrelevance. Time to pull the financial plug. Truthful and inspiring. Thank you! Stephen Blackwood, may I suggest Michael Rectenwald as one of your intellectual refugees. Come to think of it how about Bret Weinstien, Heather Heying, Janice Fiamengo etc., etc. I’m sure you have a long list already. My husband and I took photos with JBP on his Australia tour. We were told by his staff there would be no time for chit-chat, but JBP not only tolerated it but asked people questions. Most people were dressed formally, so this guy in a T shirt probably would have stood out. I can’t imagine JBP wouldn’t have seen the “Islamophobia” text, but given the situation I also couldn’t imagine him turning away the fan. VIP tickets are quite expensive, and without a clear standard being set ahead of time, there would have been no basis to deny the fan what he paid for. It was a deeply foolish thing for the fan to do. Every JBP fan knows how desperate the media is to find ways to slander him. Why provide them with the ammunition? Like it or not, we all represent the group we belong to in the eyes of others, and it is our responsibility to contribute to a positive perception. Someone scrolled through thousands of photos for something incriminating. In the process they saw beautiful photos of a sharply-dressed JBP and hundreds of people in fine eveningware. A few in more casual ware, at least one in a fake wig and glasses, and then this guy, who put everyone’s work preparing for their photo to naught. Of course the media was going to run with it. We need to be smarter, people. So, we should curtail our free speech rights and our right to wear a T shirt obviously intended to lampoon political correctness out of fear of those who seek to curtail our free speech rights and wear T shirts intended to lampoon political correctness? I think you are mistaken. The point is not to curtail your “free speech” but not to be parasitic about it in order to gain audience. Speak, by all means, but do not hijack a different topic and a different agenda. In the best case scenario you create a cacophony. In the worst, you sabotage both messages and the messenger. I did not reply to Andy – although his message annoyed me. Although he began half-apologetically, he twisted the message to pose as the person who lost more as a result of his own actions and then focused on the fact that Professor Peterson stayed on course with his own message and did not defend and amplify Andy’s own message. Andy retains at least the dignity of sensing that he caused harm, but his lack of insight and continuing “speech amplification” parasitism are inexcusable. Wear any T-shirt you want, but not in a way that makes you use other human beings. Although we don’t have to all wear an “Islamophobia” t-shirt, we all should push back against any SJW or Muslim who claims to take offense. One of the most important steps we all must take toward compelling Muslim immigrants to learn tolerance is to compel them to put up with sarcasm and satire directed at their faith. Christians and Jews put up with it. So must Muslims. Eh, they would have just found something else to reject him over. The actual “Islamaphobia” guy posted earlier in the thread and seemed a decent guy. He was criticizing the term “islamophobia” rather than denigrating muslims themselves. He lost his job over this, apparently. None of this is his responsibility. JP maybe should have though better of the photo, but then again, he’ll be fine. Better to stand for his principles than to have a fellowship at Cambridge. He’s making phat $taxx regardless. What they would have found would have been less distasteful than what they went with (or they would have chosen that in the first place). Obviously it is not curtailing your free speech rights to dress appropriately for an event. The great majority of people were wearing suits and evening dresses, a T shirt is inappropriate to begin with, and a crass one even more so. Wear it to a BBQ, don’t wear it to meet a great public intellectual. Yes, Muslims need to become desensitized to criticism of their ideology, but has this accomplished that? Or has it just been used to slander someone who barely talks about Islam at all? I saw what Andy said above, and assuming he’s telling the truth it is unfortunate (but predictable) he lost his job. Whatever his reasons are for wearing the shirt cannot be gathered just by looking at the photograph, and presumably he understands that. I don’t want to be too hard on him, because he’s probably one of the mal-adjusted guys I met at my showing who needed JBP’s advice the most, but when this “scandal” first came out I was sure that it must have been a JBP hater posing as a fan that wore that shirt. How else to explain doing something that’s only forseeable consequence was to provide fodder for the media’s campaign against JBP? Freedom of speech doesn’t shield you from criticism for completely and stupidly subverting your own cause. “Satan himself masquerades as an angel of light”(2 Corinthians 11:14). It appears that members of faculty at Cambridge have fallen for Satan’s deception to mistake J.P. for the enemy rather than friend of truth. Pray that their hearts and minds are opened. There are number of people including Vox Day and Dr Bruce Carlton who are calling Jordan Peterson an anti-christ. Vox Day has written a book called ‘Jodanetics’ to pick apart Peterson at every conceivable turn. His fan-boys are link a band of hyena’s condemning everything Peterson says and does. This is not the politically-correct crowd whatsoever. Your Satan reference made me think of them. I know Vox is a nitwit, but what the hell could he possibly be mad at JBP about? They are scared of JP. He is encouraging young people to think. And think deeply. And he is doing it calmly and forthrightly. Such people who hear his teaching will not be easy to influence or control and will cause places like VOX to lose readers. It’s that simple. He is ruining their totalitarian approach. What a wonderful discussion that has taken place above as to this article. It is so refreshing. I am so tired of commenters parroting talking points without undetlying understanding, being vulgar and concentrating on ad hominem attacks. It is reassuring to read sophisticated thought well presented. The universities have indeed been poisoned, and the worst really are full of passionate intensity, and the best, if not lacking all conviction, really have become cowardly. It’s hard to blame them, given the meanness and cruelty of the people who have ironically taken “social justice” on as their mantle. And how ironic, too, that Cambridge University Divinity School refuses to associate with Peterson because he hangs out with publicans and sinners! Liberalism is getting to be a fundamentalist religion, like the Catholic Church 400 years ago. I went up to Cambridge to read English in 1978, and during the three years I was there, contrived to avoid contamination by the postmodernism virus (even though I was occasionally subjected to mutterings about deconstruction from fellow students at King’s). I guess that virus has made inroads since then, if the university’s treatment of Jordan Peterson is anything to go by. Anyone capable of reading a page of English, or of focusing on a YouTube video for five minutes, knows that Peterson is not a dangerous extremist whose ideas threaten the fabric of our society, or a “figurehead of the alt-Right,” or any other such nonsense. Furthermore I don’t think anyone really believes that a picture of him next to a guy in an offensive T-shirt after a gig constitutes any kind of endorsement of anything. But all that matters is that he’s been successfully framed, and the university can now wash him out of its hair and go back to its quiet life on the banks of the Cam. How depressing to read the headlines! How Orwellian it all seems! - the anonymous announcement of the rescindment, the dodgy photographic “evidence”, the trotted-out pieties in Varsity. Hats off to you for at least issuing a statement about it - although it does seem a little odd to repeat something you said ten years ago, when we are dealing a scandal that is all about the workings of the modern world. Perhaps it might have been more helpful to provide some corroborating evidence of islamophobia in Peterson’s extensive published and recorded work? Any weapon one uses, or whose use one endorses, will eventually fall into the hands of the enemy. If standing next to the wrong T-shirt spells reputational death, then reputation is destined to become a fragile thing indeed. Oh - but I forgot! Cambridge has just gratuitously damaged its own reputation - and not a T-shirt in sight! Instead of using its position to provide moral compass, instead of supporting the kind of combative but civilized debate which Peterson is always careful to exemplify, the university has abnegated its responsibility and contributed to the ongoing polarisation of society. By snubbing the world’s only superstar intellectual, it has stooped to the level of the silliest undergraduate. If Peterson is not the best possible advocate for the continued study of divinity by young people in the modern world, who is? And if the Divinity Faculty cannot invite him, whom can it invite? Would it be more acceptable to invite someone with more forward-looking views - maybe someone who thinks religion is a patriarchal conspiracy? Perhaps the Faculty could invite someone who believes the Faculty itself should be closed down? Forgive my facetiousness. My point is that this is thin ice to be skating on. It is a reckless turkey that votes for Christmas. Nice letter Robert – perhaps you can keep us posted if you get a response. The only reasons why people want to silence Dr Peterson, rather than debate with him, is because they fear what he has to say. Those people who ridicule Western Civilisation and the truths which caused it to flourish are largely in the cultural Marxist/post modernist camp and know they cannot win via argument , only by exercising the power of censorship over those who threaten them . Ironically, Marxism itself is a Western philosophical construct. One created and spread by a well off, privileged white dude. A privileged white dude who lived the good life sponging off of Engels, who was a successful capitalist. Western civilisation has always provided more freedom for the individual to succeed, there was less of a hierarchal structure, with less deference paid to those more powerful or rich than in the East. The West has been incredibly successful because people have taken responsibility for themselves. There is a Buddhist saying ” Where expectation exceeds reality , there is unhappiness “. The massive increase in wealth has produced vast numbers of university educated middle class people whose expectation exceeds reality: they lack energy, initiative, courage, concentration, high pain threshold which are the requirements for those with adventurous spirits: the pioneers of civilisation. As Malcom Muggeridge has said ” Marxism is an urban religion; a product of those with a grudge against their fellow man and civilisation “. Taking responsibility for one’s life, developing discipline, vitality, fortitude, initiative, practical skills takes time and effort. As they say success is 99% perspiration, 1 % inspiration. Those who attack the traditions which made Western Civilisation do so because they are inadequate and and therefore have an inferiority complex. Consequently out of a mixture of resentment and self pity in lacking the qualities required to make Western Civilisation and spite towards who possess them, still desiring power, they seek to destroy that shows them to be inadequate. Those who create civilisation have to master base desires, – fear, hunger, thirst, exhaustion, hunger , disappointment, sloth, greed, envy, gluttony, boredom, pain, etc, etc. Whether one is Newcomen,, a Michelangelo, Newton, Mozart, Newton, Captain Cook RN, Einstein, etc, etc one needs vast amount of discipline and time to extend the frontiers of knowledge and skill. Those vast numbers of feeble effete university educated types consider they are entitled to success without the perspiration: their unhappiness has degenerated to resentment, self- pity and spite. Peterson says through self discipline master oneself , which as always been the requirement for success. We’ve got to exclude your sort to keep this place inclusive. We include all those who want to exclude others because those excluded others include those who want to exclude those that we want to include. Simple. Truth is, most of the professors and students at Cambridge these days would have a very hard time keeping up with Jordan’s thinking, arguments, etc. Ever noticed that when some catastrophe occurs, like an airliner crash, the post-event review ALWAYS reveals a long string of contributing factors? When Western Culture implodes, the post-event review will list the collapse of Western “higher education” as one of many culprits. This scenario with Dr. Peterson perfectly encapsulates how our “higher education” has descended into a petty political monolith. Currently, and indeed through much of history, what is called “Islamism” has been normative Islam. One cause of what happened between Cambridge and Peterson is that Islamists have gained a certain amount of power and influence in the UK, and people are afraid of the thousands of jihadists living there. So the kowtowing of Cambridge is not just to the Left. But the Left often works in a kind of naive tandem with the Islamists and jihadists. The Left thus opens the door to what will ultimately destroy them and destroy every other mainstream kind of party typically found in liberal democracies. A further problem contributing to this Peterson/Cambridge event is the absence of a First Amendment equivalent in the UK and in much of Europe. Far too much government censorship happening in Europe, and that creates an atmosphere where Cambridge’s censorship of someone controversial but brilliant is strongly demanded by the many who have become quite accustomed to being mental slaves. Cambridge I suppose is a private institution and within its rights to censor anyone it pleases. But government censorship is a form of violence and will only lead to more violence. John F. Kennedy once said that those “who make peaceful revolution impossible will make violent revolution inevitable.” The remedy for bad speech is not the violence of government censorship. The remedy for bad speech is more speech. The only speech that can wisely be censored is speech calling explicitly for illegal violence (and of course the “shouting fire in a crowded theater” type of situation). An eloquent and concise description of the incident. Liberals know that a few hours of common sense can undo years of liberal propaganda. This seems to be a symptom of a world-wide disease. The invitation to Don Brash (previous Governor of the Reserve Bank of New Zealand and former MP) to address a student club at the less well-known Massey University in Palmerston North was withdrawn by Vice-Chancellor Jan Thomas either for “security” reasons, or because Thomas disagreed with Brash’s views (it’s hard to say which – Thomas seems to have misspoken on the issue). Brash holds some incorrect opinions and has been known to express them. His proposed address had nothing to do with these. If these so-called elite universities stay their current course, they will eventually be their own undoing. If they insist on being citadels of social justice ideology instead of open-minded education, their customers are going to look for alternatives that provide them challenging education and preparation for the real world. At first the highest performing high school students will begin to look elsewhere, yet the ‘under represented’ will continue to come and, of course, make huge demands on their endowments. Endowments, however, will increasingly come under pressure as many successful grads will not countenance this ideological drift and lowered admission standards and stop giving. Lowered admission standards will lead to a not so brilliant student body and then not so brilliant graduates. Not so brilliant graduates will not bring the same worldly attainment, fame, and fortune. Thus endowment contributions and reputations will fall, and the spiral will continue. Sound a bit far-fetched? Well, no. Systems break down, and many of these institutions have been around for a very long time. Perhaps this current intellectual rot is the coup de grace that will prove the fitting end for superannuated entities that no longer serve their purpose. [For example, his views of alpha male’s coalition must be stored somewhere in the archaic past witrhin nature.] He obviously needed a different approach with this group; just look at any of the publicity surrounding Jordan Peterson, they must have known would create the ire generating far more substance than granting all of Jordan Peterson’s substantive research disseminated on the principles of religious guidelines into their elite, which can also be contrasted with Simone Weil’s encounters with Cathlicity in “The Spiritual Autobiography of Simone Weil”! Find Asimov’s Guide to the Bible as PDF online. Neither Cambridge could give more, nor I could expect less… Shame on Cambridge!! “The darkest hour is just before the dawn”. A beautiful and balanced article about an extraordinary, paradigm-shifting event, with first-hand touches that bring the key points of the affair into sharp focus. Professor Peterson combines articulacy and intelligence with originality and fundamental decency, so young and old alike are eager for his message of tolerance, moderation and respect with regard to time-honoured traditions. The great teachers and prophets of former times disseminated these very values, while those in power always sought to oppose and confound them. I would recommend Bruce Bawer’s “The Victims’ Revolution: The Rise of Identity Studies and the Closing of the Liberal Mind” (2012) for anyone interested in what is actually going on in humanities departments in our universities. As for Oxford, you missed out on the greatest possible opening since Duke Humfrey’s library was inaugurated – over the Divinity School – in 1488. Shame on you!